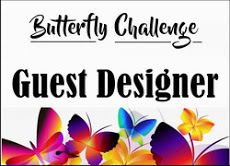 Once again this is my first post since the last Rudoph Day Challenge, but this month I have been refurnishing, and rearranging my craft room, so hopefully next month I will be more productive. In February I showed a set of cards I had made with pieces salvaged from cards I had received last Christmas. I kept back one because I wanted to use the idea again. I found a tiny image of a robin that I liked and wanted a way to use it without overwhelming it. That's when I remembered a new set of dies, purchased but not used at the end of last year. It was a set of Spellbinders Nestabilities simply called Decorative, curved square. I was pleased to find it fitted perfectly on my favourite 13.5 square cards which I always have in my stash. 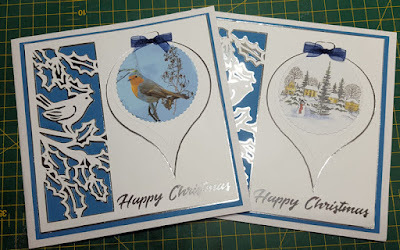 I cut the larger and the small dies from white card and used distress inks to add colour to them both. I then cut the image with the small die and trimmed the fancy edge to fit in the centre. I used Corel Photoshop to mute the colours on some backing paper and distressed its edges with the same ink. I knew I had a very old set of Anita's robin toppers and I was able to cut some of them down small enough to fit on this die. So I found a variety of backing papers and inks and two different robins, and made a set of cards. Here are just four of them. The red is a bit 'fierce' but it makes a nice cheerful card. I also found three different images from a Jayne Netley Mayhew pad, that could be cut to fit so I made these three. I have only added sentiments to a few of them. I think the others may simply have one inside, but I may change my mind and add one later. When I had used up all my little images I found I had thirteen cards. It's a good thing I am not superstitious, and these will make a great addition to my collection. 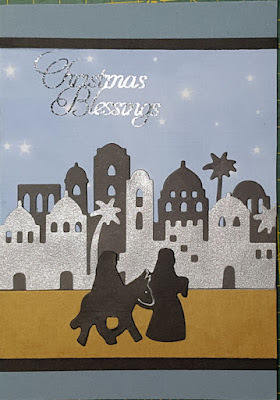 So I will link this up with Rudolph Day Challenge for March, at Scraps of life by Scrappy Mo, and remember that on 25th of each month, you too can show any Christmas cards that you have made. Well there was no Rudolph Day Challenge in January so we have had plenty of time to prepare some cards for this month. When I take my decorations down on 6th January, after the Christmas festivities, I gather all my cards together and look through them once more. There are always many that I don't want to throw away, but obviously I can't keep them all, so I carefully gather all the ones with images, sentiments, embellishments that I think I could use again... but I never do! I am sure I am not the only one who does this? So this year, I was much more selective about which ones I kept, and made up my mind to use them straight away. I always make sure that my cards end up very different from the originals, so I feel there is a 'bit of me' in their design, so here are a few sets I made. The first set use a simple image with a new frame and new background. The next ones are now mounted onto rectangular base cards, with added frames and stamping. The lower one is a salvaged frame with a new stamped image in the aperture. And the final ones are back on my favourite 13.5 square base cards with backing papers and stamping, and heat embossed sentiments. N:B: The stars punched from the border under the shepherds, are dotted around the donkey in the set above. 'Waste not, Want not' as the saying goes. So I am happy that this year my salvaged pieces have not gone to waste, and I have a nice set of cards to start off this year's collection. 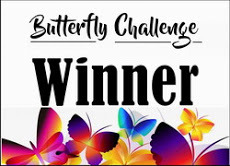 So I will be linking up with February Rudolph Day Challenge at Scraps of life by Scrappy Mo, and then I'll start thinking about March's contribution!! This is probably my last Christmas card post for 2018. I liked the way these turned out so I thought I would write a post about them. These were made using a cutting file from craftsuprint. The bird panel has three layers, the blue background, a silver layer (you can see this on the right hand card) and the white detail layer which is all in one with the whole card front. The greeting is also cut out and the silver layer extends behind it. The bauble is cut out to show the silver layer and then has three white layers added on top. For my third layer I chose two pictures and cut them with a small scalloped circle die. The robin is a photo I took in Ireland last winter, while on holiday there, and the snow scene is one made from several stamps for a project a few years ago, and then saved as a digital file for future use. This is a versatile cutting file with the option of adding colour to the cut out panel, and adding a range of stamped or printed images to the bauble. A small bow added to the top of the bauble was the only decoration I felt it needed. I am linking this to Paper Players Challenge PP421: It's beginning to look a lot like Christmas. Hi folks. Once again I have not posted since the last challenge but I have the excuse that I was away in UK for two weeks. While there I managed to get all my cards for UK stamped and left them with my son to post later, but now I am home I find I still need about forty cards for local friends, so I have been busy making some simple 'runs'. 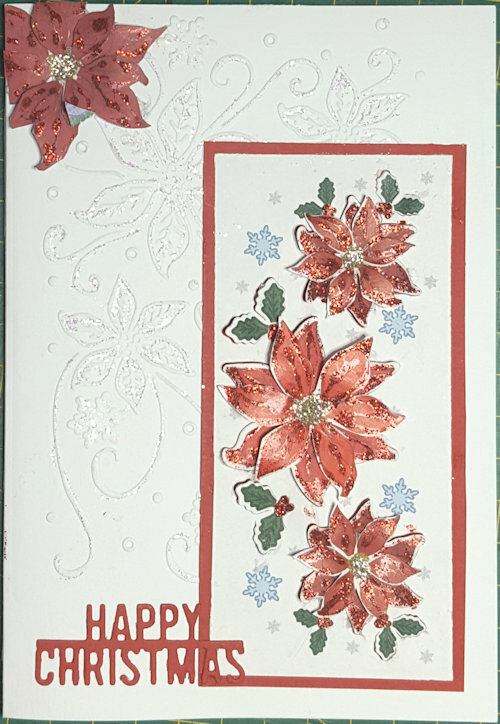 But the cards I am showing today are some I made just before I went away, using the boxed magazine set - Stamps by Chloe, Christmas Collection. 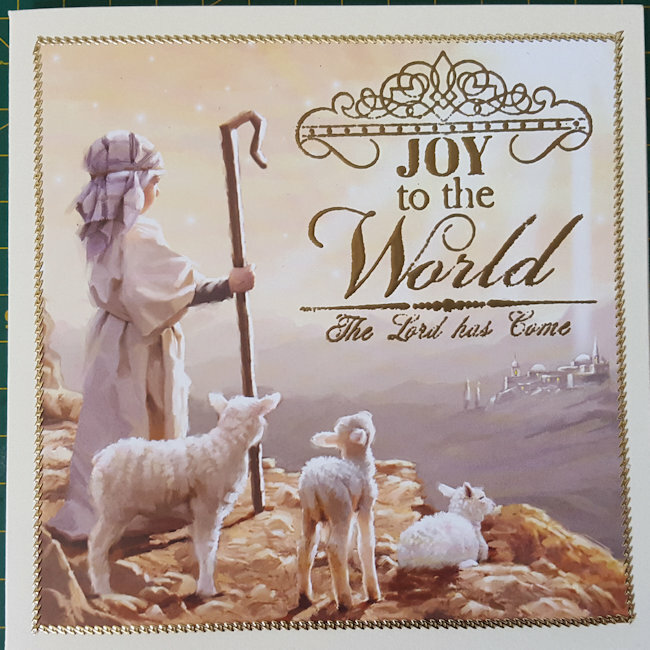 This magazine came with two dies and a set of 11 stamps to coordinate with one of them, a very pretty embossing folder and lots of papers, toppers etc. The magazine was full of examples and techniques, and although I was careful not to copy any of them exactly, they did give me lots of ideas, including using colour combos that I might not have considered otherwise. So here are three of the cards I made. 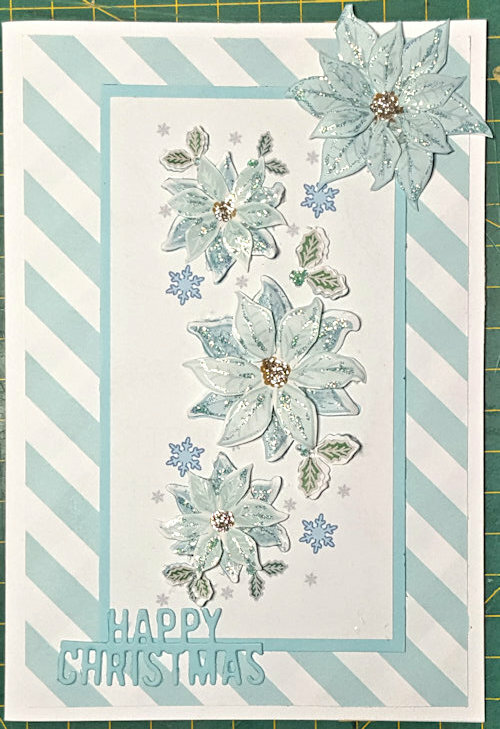 The papers and embossed background (dotted with stickles for a sparkle effect), are from the set, as are the poinsettia panels, decoupaged with flowers from the toppers sheets. The top one has a large flower corner made using an Altenew stamp and die set, and Tim Holtz and Joanna Sheen signature dies for foliage. Both sentiments are made with Cut & Make mini dies. I shall try to get some more cards made with this versatile kit, this week. 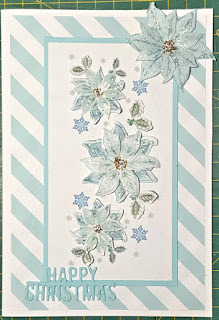 In the meanwhile I will link up with the Rudolph Day Challenge on Scraps of life by Scrappy Mo, and try and catch up on my other blog! I am back with a Nativity scene for this month's challenge. 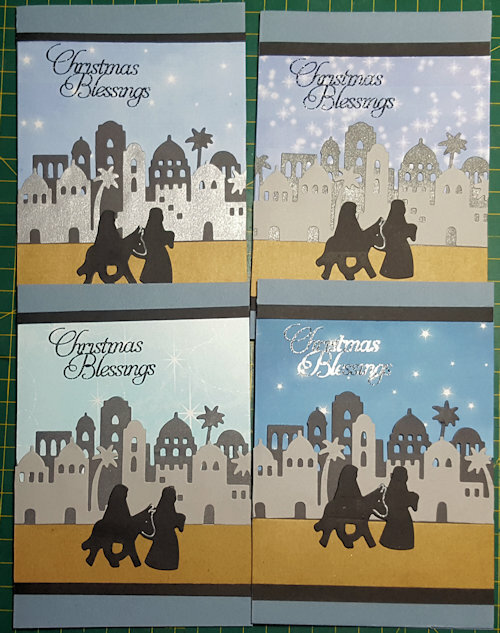 I like to use them on my Christmas cards, and this features Mary and Joseph travelling to Bethlehem, so not the usual picture which makes it nice. I made it using a very cheap set of dies from China that I bought from Amazon. I have often thought about using these but felt they were almost too cheap to be any good. I had to wait a while for them to arrive, but I can't fault their quality. I liked this set because it makes a small card. This one is A6 size, and I don't really like cards that are too big. It made sense to cut more than one while I had my Bigshot out, so I made four base cards from some rather dull blue card. Then I went though my snippets boxes and found various offcuts in shade of grey, to cut the two rows of buildings, and some black card for the figures. I used a piece of packaging to cut four strips for the sandy road, and found four pieces of starry sky paper to cut the background. I found I preferred it with a narrow black border top and bottom, and I made and cut the sentiment on my Silhouette cameo from silver vinyl. These were quick and easy to make so I shall probably make some more. but first i will link up with Rudolph day Challenge at Scraps of life by Scrappy Mo, and I will also take them over to Pixie's Snippets Playground, as it is a long time since I paid her a visit! Well I am back with some slightly 'lazy' cards. My mojo went to sleep during the long hot summer, and it has not woken up fully yet! 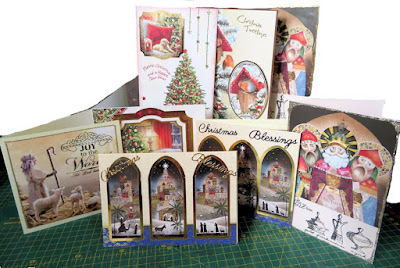 But I really wanted a card for this challenge and I need a couple of good runs of cards to complete my stash, so when I spotted this year's Hunkydory Christmas packs, I decided to buy them. I tend to steer clear of Hunkydory because so many of their kits are just too big and heavy for me. I don't make very big cards,and weight has to be a consideration as most will be posted internationally. However I could see that these packs had some smaller images and many of them looked like ones I would use, and I was not disappointed. I bought a pack of toppers and papers, and also two blocks of small images which mostly have six of each image in them. Some could be used as a simple topper with nothing added, if that is what you wanted. I had decided not to spend much time looking at their worked examples and ideas. Instead I cut sets up, rearranged them, paired them differently, made them up and them embellished them. 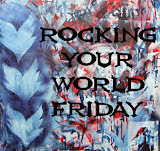 I chose several images and divided them into either what I call 'Christian' images or 'secular' images. 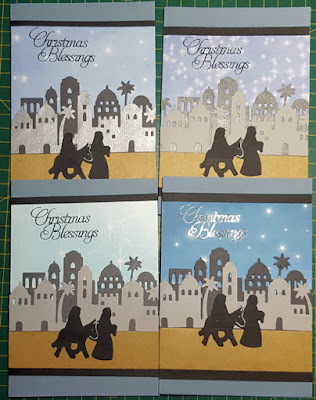 I tend to lean towards ones that depict the Nativity, the real story of Christmas, but I am happy to use the others as well, and I always add a small Bible text inside them anyway. So here are one of each that I made into cards. I then went on to make a further nine cards so far, with many more planned for the next couple of weeks if I can get myself into action. 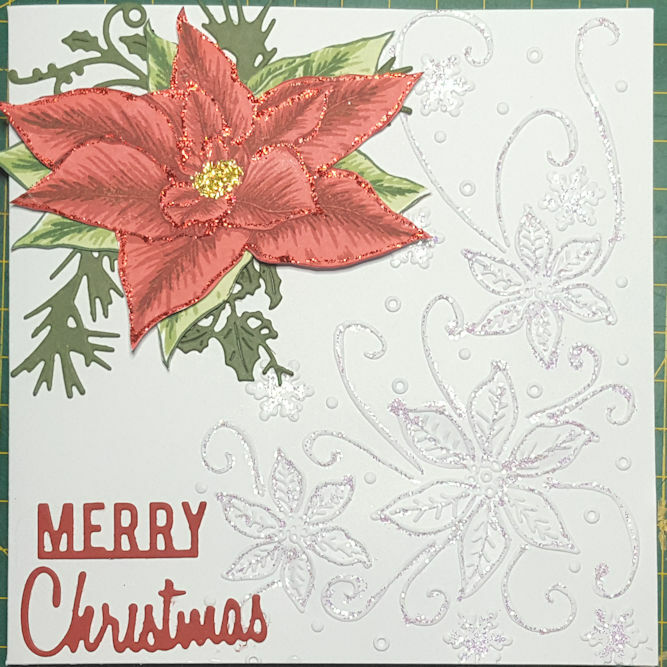 For some of my cards I found a stamped and embossed sentiment was all that was needed, or a little added glitter glue etc. For others I made mats and frames either with metal dies, or in my silhouette cameo, and added stamped sentiments and other little bits and pieces from my stash. Each one is a little bit different from the next, and I am looking forward to getting some more done now. Here are the ones I have made so far. (Please excuse the photo. I realised how very messy my table was behind this group, so I cut them out and added them to a plain backing, but I didn't have time to tidy it up much). 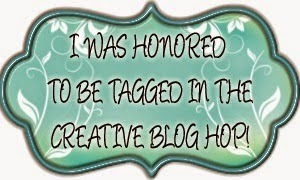 That said, it is time to link up with Rudolph Day September Challenge over on Scraps of Life by Scrappy Mo. Happy Rudolph Day everyone! I have had a very busy summer with non-stop visitors, (just one son with us now for one more week), but I was so uncharacteristically organised that I had all the cards I needed until September, made by the start of July, including this one for today's challenge. The star is an old Marianne die, and the angel and dove stamp (they were together but I separated them) is by LOTV. 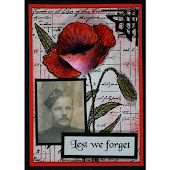 The sentiment stamp is from a clear set by Hero Arts. I stamped the image twelve times and then decided how to use them. I used pre-cut blank 13.5 cm square cards from Hobbycraft in white and cream, and rooted through my Christmas paper oddments box for backing sheets. Then I matched each paper to a toning glitter card for the star. Finally I coloured the image to go with each set and mounted them up. My doves ended up more like pigeons because when I just added grey shading to the white doves, they didn't show up on the cards, so I added a little pink and lilac to them! So now I have another twelve cards for my stash. I just need to do a few more runs like this to reach my target. So I will link these up with the August Rudolph Day Challenge over at Scraps of Life by Scrappymo, and get back to my visitor. As I have so many visitors coming over from UK this summer, I worked hard over the last few weeks, to make all the cards I need during July and August, as I know I won't get much craft time while family are here, and that included my cards for Rudolph Day. 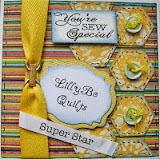 For last month's challenge, our lovely hostess Scrappy Mo used a die that I really liked. It was a Find it Media, Jeanine's Art Christmas die, featuring a pretty Christmas tree. I had difficulty finding anywhere outside of USA that was selling it, and I have been caught on import tax and heavy P&P too many times to order from there, but Mo helped me find a source and I did buy one, and at the same time I bought another die from the same set, featuring stars, so that is what I have used for my card this time. I found a half-used sheet of scrapbook paper that was just big enough to cut the die frame twice. The paper is very pretty and where it looks green in my photo, it is actually gold. I have a huge stash of glitter card from our cheap 'Todo' (means everything) shop, in a great range of colours, so I used a darkish brown one as a hand cut mat behind the frame. 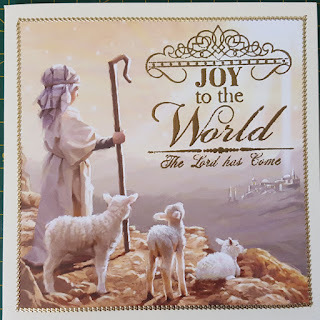 It came with a circle die for the aperture, so I made an insert to fit, using a small LOTV stamp of a stable, which I added a tiny nativity scene to for a card I made earlier this year. I generated the sentiment on the computer and added an amber gem to the centre of the star. For this one I matched my aperture colour to a plain cream purchased card blank. For the second die cut I had flipped the orientation of the die (by cutting from the back of the paper instead of the front). I followed the same steps as above but mounted it onto a dark brown card. The backing paper looks prettier in this one. In both my photos everything looks a bit off kilter, but they are both straight in real life! I must have been having a bad camera day. So that's two more cards for my collection, but I need to make a big run of one soon, as I have fallen behind somewhat since my excellent start to the year! I will link this up with Rudolph Day Challenge; July and I 'll be back again in August.